Lowry Grove residents and allies gather in Antonia Alvarez's home to save their homes. Photo by Cirien Saadeh. The walls of Antonia Alvarez’s home are covered in her children’s awards, school projects and artwork, alongside old family photos. Her kitchen table has been a planning and gathering space for dozens of protests, rallies, and meetings in the fight for immigrant justice. 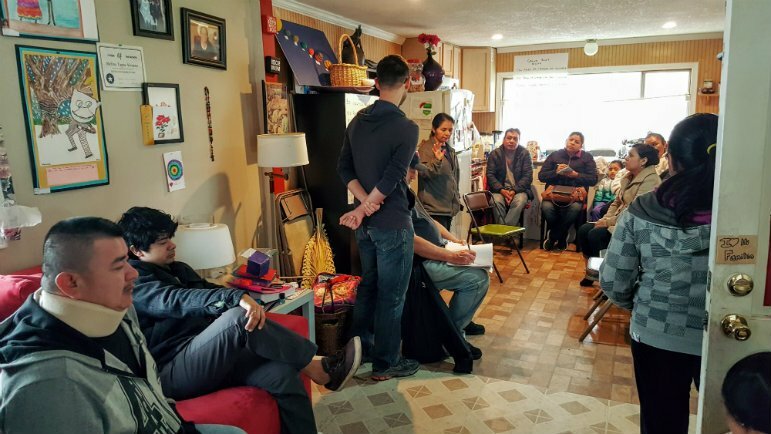 During an early morning meeting on April 29, 20 residents and friends of the Lowry Grove manufactured home community, where Alvarez and many others live, gathered at that kitchen table as they plan and work to save their homes. Last week, the owners of the park announced that Lowry Grove will be sold to Continental Property Group (CPG). However, residents are not going down without a fight. “We won’t be defeated until the last minute, and we’ll decide what the last minute is,” Alvarez said. Alvarez is co-founder of La Asamblea de Derechos Civiles, a Latino immigrant justice organization. Lowry Grove is a 15-acre park and is occupied by 96 manufactured homes located in the inner-ring suburb of St. Anthony. According to a report from Housing Justice Center, 180,000 Minnesota residents live in manufactured home communities, commonly known as trailer parks. Minnesota has 900 manufactured home communities and 80 percent of their residents are considered low-income. Additionally, 42 percent of residents of manufactured home communities have resided in their home for ten years or more. And more families live in manufactured homes than HUD subsidized units and Rural Development units. Most manufactured home communities are located on land valuable for commercial development. At the April 29 meeting, residents gathered to discuss their organizing options, trying to make sure they are compensated fairly if the park is sold, maybe buying the park as a community and running it cooperatively with the support of St. Anthony Village, or ensuring that CPG does not develop on the park property if they do buy the park. “We don’t care if [CPG] buys it as long as [they] don’t take away our homes,” Alvarez said. In order for the residents to buy the park themselves, they would have to come up with $6 million of financing needed to counter CPG’s offer. The contract finalizing the park’s sale is expected to be signed June 11. About 1,000 of the United States’ 55,000 manufactured home communities are cooperatively owned by resident communities. In 2004, two parks became cooperatively owned in Minnesota: Sunrise Falls in Cannon Falls and Paul Revere in Lexington. According to Lowry Grove’s managing partner Phil Johnson, managing the park has become more difficult in recent years due to its aging infrastructure. Traci Tomas, president of CPG and a former employee at Lowry Grove, said the company’s plans for the property are residential and include some affordable housing options. However, Alvarez argues that the park is their home, and they should not feel this uncertainty about where they will be living in the near future. “The question is, you have your family, your children, would you like someone else making a decision for you about where you can live? They are making decisions about my family, my future. We live in Lowry Grove park. Our life is there,” Alvarez said. Residents are concerned that despite owning their homes, they will lose them due to the sale of the park. Most of the manufactured homes at Lowry Grove cannot be easily moved. Tomas noted that the current owners of Lowry Grove have been trying to sell the property since she worked there ten years ago. During Saturday’s meeting, residents shared their frustrations with this lack of transparency. “If they had a plan to sell it, they should have told us. We invested in our homes. We invested a lot. If they had a plan to sell, why didn’t they tell us,” said Jose de Jesus Vilchis Serna, a resident who attended the April 29 meeting. Residents at the meeting stated that their greatest concerns with the sale of the park are the safety and security of their families, as well as dignity and respect for park residents. “There is no way you can compensate for the loss of a neighborhood of a hundred families,” said Ned Moore, Development Director with La Asamblea de Derechos Civiles. Lowry Grove residents and allies visited Tomas’ office in Wayzata, as well as the office of Sen. Al Franken, during a Monday meeting. Tomas was not scheduled to meet with them, but she attended after much urging and phone calls from friends and residents. Residents met with Tomas for 30 minutes to share their testimonies. “The results of yesterday’s meeting was that Tomas, for first time, heard from residents of Lowry Grove about the challenges they would face: having to transfer their children outside of their schools, losing their homes, the loss of the community,” Moore said. On May 10, residents and organizers plan on attending the the St. Anthony Village city council meeting to ask for their support in their organizing. They also plan to continue meeting as they work to save the park. “The plan is for them to let us live in this park,” Alvarez said. Currently, the City of St. Anthony’s comprehensive plan urges that city planners consider redevelopment of Lowry Grove. However, Alvarez also urges more of the park’s white residents to step up. As of now, the majority of residents fighting to save the park are Latino. Disclaimer: The author of this article formerly worked as part-time staff for La Asamblea de Derechos Civiles. I feel there ought to be an equitable solution to this. “According to a report from Housing Justice Center, 180,000 Minnesota residents live in manufactured home communities, commonly known as trailer parks.” The real question is why the media always wants to put down our manufactured homes and communities. Why the need to call them “trailers”? It is a degrading term which does not depict what manufactured housing offers to people. These homes are factory built homes constructed to very high standards. They are placed in manufactured land lease communities or on private land. These are lovely non-subsidized, affordable housing options for people and families, no matter what their race. Why does the media always have to “put down” this housing choice ? Many families that live in land lease communities do so because they like community style living and it gives them a sense of safety and belonging. Your story is interesting but your need to put down the housing choice is unacceptable. Michelle, I don’t think the term “trailer” is intended to be derogatory, merely explanatory for those who may not be familiar with the term “manufactured home,” especially considering that the article author only uses “trailer” once. During my childhood, the term “mobile home” was often used to refer to a manufactured home; “trailer” usually meant a smaller unit used for camping. I have lived in central St. Paul for several years, previously lived in central Minneapolis, and spend very little time in the suburbs. I knew there were probably manufactured-home communities in the exurbs, but did not know there were any in first-ring suburbs such as St. Anthony. Therefore, this article was informative to me. Before their retirement, my parents had a small business connected to real estate, and I agree that manufactured homes are one alternative lower-income families have to renting. However, I also think manufactured homes are more suitable for climates warmer than the upper Midwest: I had a middle-school friend who lived in a mobile home and have been an occasional guest in manufactured homes as an adult; to me, they never seem quite warm enough during the winter. I hope the Lowry Grove residents prevail in preserving their current location and community. If not, may they at least be adequately financially compensated to move their existing manufactured homes, or purchase new ones elsewhere in a new location of their choosing. In this situation, the preservation not just of housing but community is important. Agree that news coverage too often displays this attitude. The owner of the property has the right to develop or sell the property as they see fit. If the laws are followed, residents are compensated fairly etc. what is the problem? Perhaps better terms should gave been negotiated if a sale occurred. Too late now. Compensation of $4,000 for moving of a home would be adequate if the home can be moved for that price. I paid $12,500 for my home 3 1/2 years ago. It is a 1973 model. I have put approximately $3,000 into it since. I now will need vinyl siding and shingles if I am to move it to another park. There is only one park in the 25 mile radius that will take homes older than 1995. Ms. Tomas indicated to me in the May 9 meeting that they would work with me to accomplish this. I will call them if the park is closed on. I feel bad for the families with children or those who have purchased their homes in the last 6 months. Many have. If we are compensated properly, there is no problem. It’s unforntunate these folks are being asked to relocate, but if they don’t own the land the mobile homes sit on, what did they eventually expect. The park has been rumored for sale for years and it seems the property owner has the right to do what they want if it meets the goals of the city and the zoning requirements. I would love for this to become a cooperative. I live here 3-5 months out of the year and would be soooooooo very happy if there was some way to save it. This is a fantastic location for those of us who want to bicycle/walk/bus because we are centrally located. There are elderly and those getting there who want to stay mobil. Living here is great. You hear a lot of negatives about this park….but there are so many things wonderful about this park….Like the MAJORITY of the people who live there. It is a community within itself. I am truly sad to think this is my last year to spend my summer here. I’ll be forced out to Savage or someplace …miles and miles from my family …paying way above what my budget allows. It might mean I can’t come back next summer to see my daughter and grandkiddles. It is all quite sad…but the park has not been maintained to standards…so it was just a matter of time that a developer decided to “put up a parking lot” or SOMETHING…..and the trees….beautiful trees. Heavy sigh. This is very sad to hear. We come from out of state, and use the RV sites, at State Fair time it is full. Though out the rest of the year we use it when visiting the Cities. This one of the few major metro area RV parks in the Country. Hoping you think of the family’s and travelers. I’ve lived here for the past year. I agree that location is fantastic. But the park is in poor condition, and I don’t see how the people living there are going to be able to buy and make the necessary rennovations to being the park up to standard.